To start with, peel of the outer layer of the raw jackfruit ( Panasakatha ) and cut into small pieces . 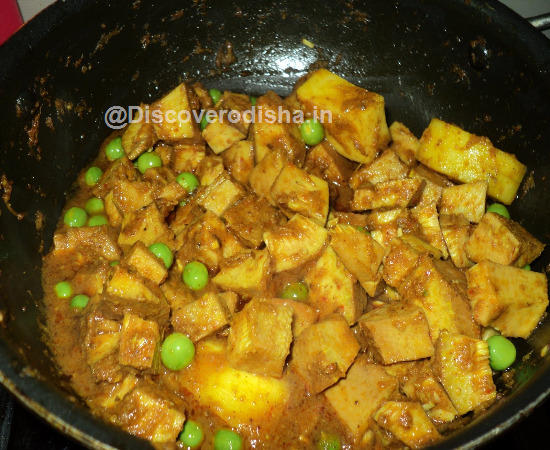 Cut the potato ( Aalu ) into small cubes. Par boil the pieces of potato (Aalu) and jackfruit ( Panasakatha). Finely chop the onion ( piaja ), ginger ( ada ) and peel of the garlic ( rasuna ) cloves. Make a fine paste of the finely chopped onion (piaja), ginger (ada) ,garlic ( rasuna ) and jeera ( cumin ). Finely chop the tomatoes. Heat oil in a frying pan, fry the boiled pieces of potato ( aalu ) and jackfruit ( panasakatha ) and keep it aside. Again heat oil ( refine oil ) and add phutana. After it starts spluttering add the above paste ,turmeric powder ( haladi gunda ) and chili powder ( lanka gunda ) and fry it Then add the finely chopped tomatoes ( bilati baigana ) to it and fry. Then add the boiled potatoes ( Aalu ) and jackfruit(Panasakatha) to the above paste and add salt to taste and frequently stir till they blend well with the paste . Add water ( 2 -3 cups ) to it and stir well and cover the lid. Cook on a lower flame for 5 minutes. After it is done, switch off the gas and add the cinnamon and cardamom powder to it. Serve hot. Panasakatha ( Raw Jackfruit ) – 1 medium size Aalu ( Potato ) – 2 to 3 medium size(200gm) Piaja ( Onion ) – 2 medium size(200gm) Rasuna ( Galrlic ) – 15 cloves Ada ( Ginger ) – 1 inch Bilati Baigana ( Tomato ) – 2 (100gm) Refine Tela ( Refine Oil ) – 75gm Haladi Gunda ( Turmeric Powder ) – 1 tbsp Lanka Gunda ( Chilli Powder ) – 1 tbsp Jeera ( Cumin ) – 2 tbsp Phutana ( Cumin, Mustard seed, Methi ) – 1tbsp Dalchini ,Gujurati Gunda ( Cinnamon and Cardamom Powder ) – 1tbsp Salt to taste.